RV Parking in the Boston Area? We are driving an RV across country and would like to visit Lexington/Concord area one day and then Boston downtown area the next and then down to Plymouth. Is there somewhere we conveniently park an RV and take the T into the city. Are there any RV parks near Belmont? Amy, that sounds like a wonderful trip. There is an RV park close to Concord - Minuteman Park in Littleton - that is close to the commuter rail line that goes to Concord. If you're bringing bikes, you could bike to the Littleton rail station, take the train to Concord, and then bike from Concord through Lincoln and then on to Lexington on a "rails to trails" bike path called the "Minuteman Trail." You'll find famous historic sites in all three of these towns, especially in Concord and Lexington. The bike path goes through parts of Minute Man National Historical Park, where some of the opening battles of the American Revolution took place back in 1775. If you're here in mid-April, you can see numerous reenactments of those events in the park, Concord, Lexington, and other areas as part of our local Patriots Day celebrations. You can find more information about the Littleton RV park here. 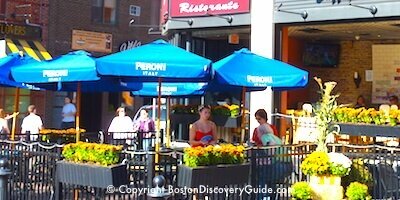 As far as I'm aware, there are no RV parks near Belmont, as it as well as surrounding towns are practically in Boston, where there is scarcely sufficient room for car parking, much less anything larger. Since parking a car in a Boston garage can easily cost $40-$50 day, I shudder to think how much parking something as large as an RV might cost! If you are choosing between RV parks in Littleton or Plymouth, I believe the Minuteman Park in Littleton would be the closest to Boston. Your best option for getting into Boston would be to take the commuter rail train from either Littleton or Plymouth (or some other point, depending on where you stay). 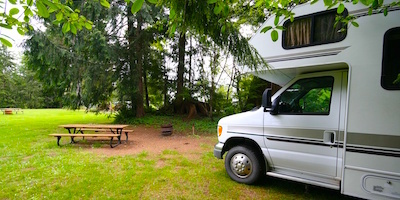 As soon as you know your dates, you may want to make reservations in whichever RV parks you choose - they have relatively small numbers of spaces for RVs available, and they tend to fill up very early in the season.